Powerful systems for commercial studios, creative composing and recording, scoring stages, sound editing, post-production, video game sound design, and mix down. Premium sound quality is a top priority for your studio, and it’s a top priority for RADAR. In fact, we’d be lying if we said sound quality wasn’t RADAR’s best feature. 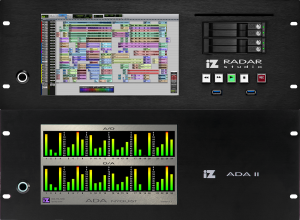 With a near-zero jitter, a pristine signal path, and the latest in world-class converter technology, RADAR transcends the digital barriers of sonic quality. There is simply not another recording device on the market that moves input to output as impressively as RADAR. RADAR made its name as the finest digital audio recorder, but now it’s proving to be a fine DAW host too. Running Pro Tools or your preferred DAW software natively you can track, mix, and automate, using all the plug-ins and features your workflow requires. RADAR systems purpose-designed to run audio, and are rock-solid. You won’t have to make excuses for your RADAR. Think about it – without techno-tweaking and re-booting your DAW, how much more great music could you capture? RADAR comes with dedicated expert support. We don’t expect anything to go wrong, but if it does our support team is at your beck and call; whether on email, phone or Skype, we’ll fix your glitches or answer your questions. When you record on RADAR, you’re 100% focused on the sound.